The NFL’s wild weekend of wild-card games demonstrated that even in this age of explosive offenses, defense still dominates in the playoffs and it often comes down to a toe, a few fingers or even a 40-year-old hamstring. Kicker Sebastian Janikowski’s season — and maybe career — ended when he popped his left hamstring on an errant 57-yard field goal try just before halftime of Seattle’s 24-22 loss to Dallas on Saturday night. Without a backup plan, the Seahawks had to go for it on fourth down in field-goal range and had to go for 2 points after a touchdown rather than try to kick it through the uprights. And when they pulled within a field goal with 1:18 left, they were toast without a Plan B for an onside kick. Punter Michael Dickson’s drop-kick went way too far and Dallas receiver Cole Beasley made what might be the easiest catch ever to seal a playoff win. The onside kick nearly disappeared in 2018 after the league’s competition committee last offseason outlawed teams from stacking one side or getting a running start. The rules were designed to cut down on concussions but drastically reduced the onside kick as an option. Only four of 54 attempts were successful during the regular season, an 8 percent success rate that pales in comparison to the 23 percent conversion rate in 2017, when 13 of 55 onside kicks were recovered by the kicking team. Coach Pete Carroll figured Janikowski simply hurt himself trying to kick the ball as hard as he could. And Seabass might have kicked his final game in the NFL. The 40-year-old isn’t under contract for next season and also got hurt last month. 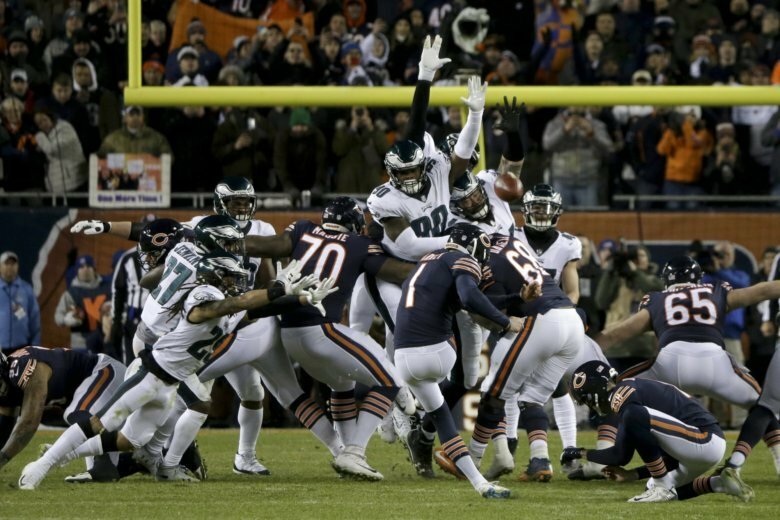 On Sunday, Chicago’s dominant defense that led the league by yielding just 17.7 points a game held the Philadelphia Eagles to 16 points but lost by a point when Bears kicker Cody Parkey, who made 76.7 percent of his kicks in the regular season, double-doinked a 43-yard attempt in the final seconds off the left upright and the crossbar. He said after the game he thought he hit it well and was at a loss to explain the miss. Turns out, Philadelphia defensive lineman Treyvon Hester tipped the ball. After reviewing the play and seeing Hester’s left hand hit the ball, the NFL officially ruled it a blocked field goal on Monday. That provides some explanation but little consolation for Parkey and Bears fans, who booed Parkey as he ran off the field after kneeling with teammates and opponents for a postgame prayer. He was at his locker as soon as reporters entered and accepted responsibility for the loss that abruptly ended the Bears’ first playoff appearance in eight years. Eagles kicker Jake Elliott was one of several players who stood up for Parkey on social media. — The Chargers flummoxed the Ravens by lining up with seven defensive backs on all but one snap in their 23-17 win in Baltimore. Rookie All-Pro safety Derwin James set the tone when he dropped Lamar Jackson for a 1-yard loss on the first play from scrimmage. The alignment bottled up Jackson, who had run for nearly 700 yards in his seven starts and finished with just 54 yards. More importantly, the Chargers made sure Jackson couldn’t bring back the Ravens with his right arm after they fell behind 23-3 midway through the fourth quarter. — The league might have some tweaking to do to the catch rule. Or, rather, recovery rule. Just before halftime of the Eagles-Bears game, Mitchell Trubisky hit wide receiver Anthony Miller with a pass. Miller took a few steps before Philadelphia defensive back Cre’Von LeBlanc knocked it loose. Neither team’s players went for the ball near the goal line, and an official picked it up . The play was ruled an incomplete pass although replays showed Miller securing and then losing possession, making it a completion followed by a fumble. But because it didn’t go out of bounds and neither team secured it, the rule states it has to be an incomplete pass , as Al Riveron, the NFL’s senior vice president of officiating, explained on Twitter. — ESPN apologized for playing “Dixie” during the Colts-Texans game, when the song was added to a lighthearted look at Andrew Luck’s Twitter alter ego, Captain Andrew Luck. ESPN had produced a graphic that depicted Luck as a Union general being protected by both Union and Confederate soldiers. It was based on a parody account that pretends Luck is a Civil War officer writing letters to his mother. AP Pro Football Writer Rob Maaddi contributed to this report.